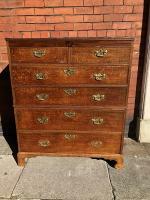 An Edwardian wash stand C1910 hand painted and waxed with Annie Sloan paint. Solid marble top and back. 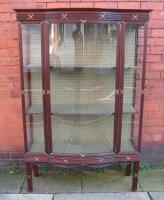 A small Edwardian Mahogany display cabinet with original leaded glass in excellent condition. Beautiful inlay throughout. 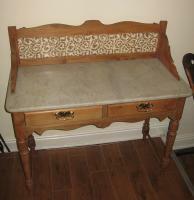 A pine dressing table with marble top and original tiled back. Circa 1880. 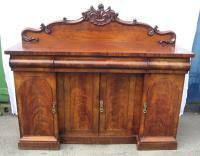 An early example of a bow fronted corner cupboard C1830 constructed of oak and mahogany. In superb condition. Depth: 50cm, Height: 108cm. 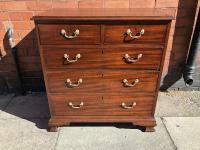 A good quality set of Edwardian mahogany chest of drawers with turned wooden handles. 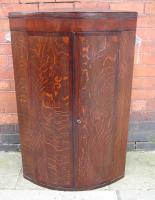 A superb elegany walnut bow fronted display cabinet standing on square chanfered legs. Has beautiful gilded details and ornate carving. C1820. 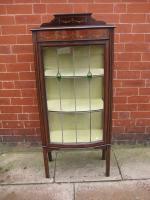 An Edwardian walnut display cabinet C1900. 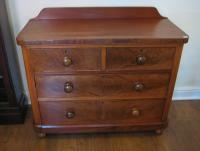 This item is in excellent conditon standing on beatifully moulded feet typical of the period. Has three solid wood shelves partially covered with the dralon fabric.